Another fast weekend of racing by A3 athletes. A weekend that brought a first and many, many PB’s. 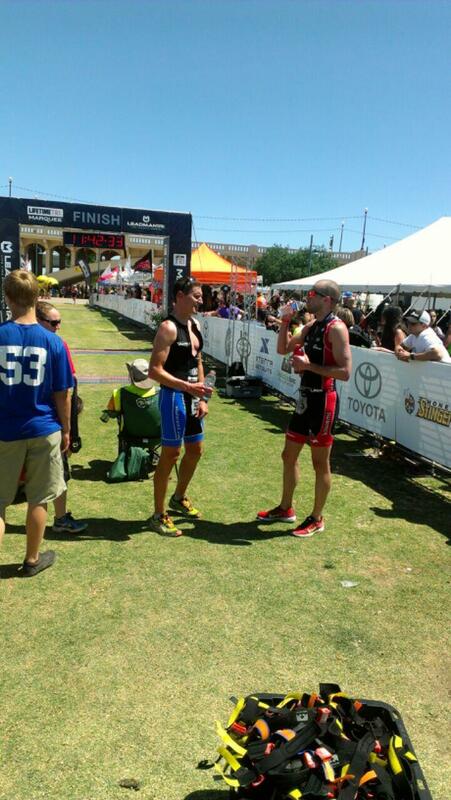 At IM South Africa Nick opened up his pro career with a brand, spanking new IM PR of 8:48. But not only did he break 9:00 for the first time, knocking a measly 22 minutes of his previous IM PB, he also knocked 6 minutes off his IM marathon PB and did that after riding 112 miles faster than he has ever ridden it before. After dropping several spots early in the run, his steady pace brought him up over seven positions to net him 11th. It was a great hit out as a first time professional in a race. Do you know what else happened in that race? Mark was racing, trying to avenge his 4th place finish from the year before. Mark rode according to the plan, letting a lot of guys ride past him. His plan netted him an IM bike PB ride dipping under 5:00 for the first time. Starting the run, he was down, way down, just over 13 minutes down in his age group. Seven guys in his age group were closer to the finish line then he was. But when it really matters, in his age group, could he do it on the run, could he pull back :30 per mile to win his age group and secure a Kona spot after riding faster than he has ever in an IM? Not just a few seconds here or there, he had to run 7.5 seconds faster per quarter mile for every single quarter mile of the race to take the lead in his age group. And he had to do it over the guy who won the age group in 2012 by 20 minutes. And so the chase began. 7 guys, just over 13 minutes and the 3k of distance already covered by the leader stood between him and the top step. Mile after mile, the splits came down, the guys in his age group fell to the wayside as he charged along the course. He moved into 6th, then 5th, up to 4th, then into the top 3. The course was getting shorter, the finish line closer. Second, after moving into second one guy stood between Mark and the age group win. With only single digit kilometers between Mark and the finish, with his competitor yet closer to the finish line, he was still minutes back. He continued the chase, the gap was coming down. Instead of :30 per mile it was :30 per km. Could he do it? Under 6k to go and no leader in sight. At 5k to go, up ahead, the age group leader came into view. With just under 4k to go Mark glides by and there is no response. It took a PB in the marathon, a 3:13:28, a marathon that was 10:41 faster than anyone else in his age group and a sub 9:20 time to secure the title. He went from 46th overall off the bike to 27th overall at the finish line. What a great race. Half a world away, Bill and I toed the start line at the Leadman Tempe Triathlon. It’s always tough when you’ve been on the east coast and Mother Nature has slammed you weekend after weekend with bad weather. It’s hard for guys to come west and race a long course race so early in the season. I’m pretty sure Bill was a little nervous about the power plan I sent him at first glance. Add in sun, a trail run that was technical at parts, one of his first really long bike rides outside, he made a pretty good race taking a top 3 spot in his age group. The results have changed daily since the race, the above link may or may not be accurate. My race turned out well. After resorting to a Jedi swim trick to stay with the wave leader in the swim. The first 1.5 laps consisted of a few of us swapping the lead several times. I just listened to my power meter and rode according to plan with a 2 minute negative split over the back half of the race. While my watts and p/wt ratio are on the small side, just like my biceps, I confirmed that I can go faster then most on less watts thanks to a good position on my bike. My watts per lap were 208, 212, 211, 214 for an AP of 211 and NP of 221, which was lower than everyone I talked with after the race by 15-35w on the AP side. I gave up the lead in the M40-44 age group as I stopped to add nitrogen to the soil around a tree so that it grows up big and strong. With one of the slowest runs in the top 20 I strongly suspect that I was going to give up that lead even if I didn’t stop to pee on a tree. All in all a good day for A3 athletes as we got that early season race out of our way.